A septic tank pump out is best performed by a qualified plumbing contractor. Our trucks are equipped with the technology to make a necessary task as painless and uncomplicated as possible. 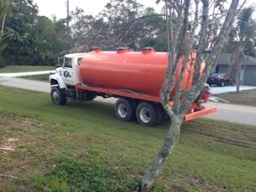 Diversified Plumbing services specializes in septic tank pump outs in the Cape Coral – Fort Myers area and throughout Lee and Collier County, including the communities of Lehigh Acres, North Fort Myers, and Bonita Springs. Diversified Plumbing Services offers trenchless sewer cleaning and sewer repair in the Fort Myers – Cape Coral area and throughout Lee County. A sewer system isn’t something homeowners think about until something has gone wrong. If, however, they do give it some thought and some attention, they will save themselves a lot of money. Contact Diversified Plumbing Services to have your sewer inspected. Our experienced and fully insured technicians are available 24 hours a day, seven days a week. They can pinpoint any problems right away and give accurate, affordable estimate on the spot. Call Diversified Plumbing Services for a Residential or Commercial Septic Tank Pump Out Quote or Sewer Service, or use the form below to contact us.